I am diverging in this blog from my normal subject of Latin America to something which is aggravating my daily life. As a BART commuter I can’t help but be annoyed by the group Anonymous’ recent antics. I am full support of protest, social movements and civil disobedience but not of this sort. The group Anonymous claims to be protesting for BART riders when in reality the only people being hurt by their protests are BART riders. They started their protests by hacking into BART’s website and releasing thousands of innocent BART riders personal information. A few days later, they protested in the Civic Center BART station which briefly disrupted trains. The next week, they again protested at Civic Center which they shut down, then they continued their protest down Market Street which led to the closure of the Powell and Embarcadero stations. This is when it all really started to grab my attention as I get on BART at Embarcadero to head home to the East Bay, if I were a little late getting on BART last Monday I would have been stranded in the city struggling to get home. On the News they interviewed commuters stranded in the city waiting for the stations to reopen so that they could go home, they mentioned how they were tired and hungry. The News interviewed other commuters who had to used their sick time so that they could leave work early to try to avoid the mayhem. Then, yesterday, Anonymous had yet another protest, this one commuters seemed to better anticipate. As I was watching the Morning News they said that traffic was higher than normal most likely because people weren’t taking BART. When I got on the train in the morning everything seemed pretty normal. It was when I was coming home when I noticed the difference. I left work five minutes early to try to get out of San Francisco before the expected protest at 5PM. When I got to the station it seemed empty, not at all packed like it normally is on Monday at 5PM. Then around 5:20 PM when I was already close to home, there was a message on the train stating that Civic Center station was closed due to civil disobedience and no trains would be stopping at the station. Immediately all of my fellow riders moaned and rolled their eyes. Now, not to be misunderstood, our eye rolling was not from frustration from BART but rather frustration from these protesters disrupting people trying to get home. When I got to the Walnut Creek station I was surprised to see the parking garage virtually empty and an unusual backup of cars trying to get out of the garage. It appeared that other commuters must have left their work a lot earlier than I did to try to avoid the protests. When I got home I turned on the News to see live coverage of the protests. The Announcer said that there was about eighty protesters. As I scanned the crowed these protesters did not look like the social justice workers I am used to seeing at protests, those that thoroughly study an issue before they head out to speak their minds on it. But rather young people, looking not all that different from the young people I saw beating each other up at this weekend’s 49er-Raiders game. (As a side note that was my first NFL game ever and will be my last. I’ve never felt so unsafe at a sporting event. It was out of control mayhem.) The protesters also did not look like the people who I ride BART with everyday. The protesters seemed like people who were out on the street because they are mad at their current situation and wanted to protest something. I doubted that any of them could give a logical argument for the protest. Then suddenly the Announcer stopped and the camera turned as a frustrated commuter walked by and shouted something at the protesters and then was chased down Market by half the protesters in the camera’s shot. I quickly thought this is not the civil disobedience that I support, this is sickening and needs to be stopped. Now, I am not arguing that BART’s actions over the past year have been commendable. From the killing of Oscar Grant to the killing of the homeless man to cutting off riders cell phone service to disrupt a protest BART is in dire need of restructure and investigation. I myself have been personally frustrated with BART several times. I can not tell you how many parking tickets I have received because I was forced to park in the wrong spot because they do not offer enough parking and the permits for parking are not available. But Anonymous’ actions are no way to deal with BART’s problems. My first concerns with Anonymous is that they have no organizational structure, there is no leadership or clearly defined strategy. Also, instead of calling it protesting the group calls its actions ‘attacks’ a extremely more violent word. The main problem at the center of Anonymous’ antics is that all of its actions have hurt BART riders not BART itself. The main victim at the center of the groups’ actions have been the people whom they are supposedly advocating for. How can you protest for justice for BART riders when all you are doing is hurting them? I am not in support of civil disobedience that is not peaceful, that harms innocent civilians. 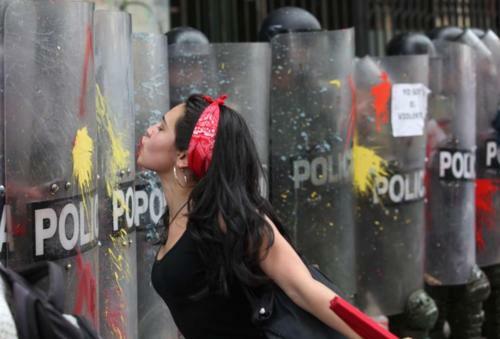 The protests in Chile have been supreme examples of what civil disobedience should look like. Pillow fights, dance numbers and joining together for a common cause. 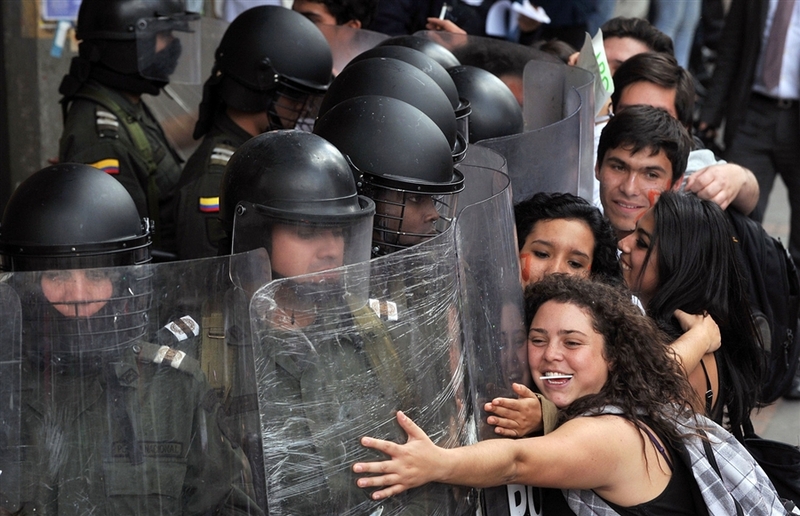 The protests in Chile have remained peaceful, the students did not turn violent, even when the police turned violent on them. Not at all like Anonymous who last night threw stink bombs at police at broke the glass of bus stations, who have been seen climbing on the BART trains to prevent them from moving. The Anonymous protests have not been organized, thought out and in my mind no intellect has been used whatsoever when it comes to their actions. The majority of BART riders are not CEOs or people of high income. Most BART riders are average folk who may not be able to afford commuting to work by car. A lot of BART riders are people who are environmentally conscious and for that reason decide to take public transit. A lot of BART riders are like me, that can barely afford the daily BART commute but since it is cheaper than commuting by car deal with it. They do not deserve to take the blow from Anonymous’ actions. Many of us riders cannot afford taking any more sick time to avoid Anonymous’ brutality, we also cannot afford taking a taxi out of the city once we have been stranded due to Anonymous’ attacks. I cannot believe how ignorant Anonymous is to the fact that the victims of their actions are those whom they are trying to defend. However, at the same time it make sense that a group with absolutely no coherent cause would be not only be ineffective but attack to the innocent public. Now, it has been reported that Anonymous is planning yet another protest next Monday. One that once again will make BART riders leave work early to try to avoid. However, I suggest that us BART riders unite together against Anonymous and say enough is enough. BART riders should meet together in open forum and discuss issues they are not happy with and then present them to BART and then work together from there. But this disruptive, angry mob will never accomplish anything beyond making BART riders frustrated. Anonymous we BART riders do not appreciate whatever it is that you were trying to do but please cease and desist. Let us figure this out without you.